Just Released - A Dark & Dense Napa Valley Single-Vineyard Beauty! 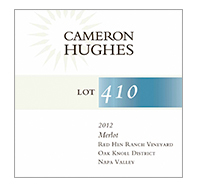 Lot 410 2012 Red Hen Ranch Merlot comes from the Red Hen Ranch Vineyard located in Napa’s Oak Knoll District. Oak Knoll is one of Napa’s best places to grow Merlot – it sits atop the valley’s largest alluvial fan formed by Dry Creek (different from the Dry Creek Valley of Sonoma), and is basically 10-20 feet of cobblestones covered by a bit of loamy soil, with late afternoon breezes keeping temperatures slightly cooler than the upper valley. The resulting Merlot berries are small and concentrated, producing wines that display a Cabernet-like structure. Fruit from Red Hen Ranch goes into some very high end Napa Merlot, Cabernet, and Meritage programs ($75+), but as always, we aim to vastly overdeliver on quality and price. Whether you like Cabernet or Merlot, I think this steal of a wine will have a broad appeal to both tastes – the final blend falls at 75% Merlot, 25% Cabernet. Opens with aromas of plum and blueberry fruit, spice, mocha, and crushed rock notes. On the palate, dark blue fruit is wrapped around a tightly wound core of dusty tannins. Fruit, earth and minerality are seamlessly meshed, leading to a long and sustained finish that only begins to hint at what’s yet to come. This is a densely packed and substantial wine that needs a good hour in a decanter, and would definitely benefit from a few years in the cellar. Fantastic with grilled steak. As a New Release special offer, go ahead and take 15% off any purchase of one case or more through Sunday night at midnight (Wine Club members get 20% off) as long as it includes one bottle of Lot 410 (mix and match the whole store! ).